2019 is off to a good start. Trout fishing on the Guadalupe River has been great. Although higher flows have made wade fishing pretty tough , float fishing has been good, and the trout really do much better with more water in the river. An additional benefit of the higher flows is a longer season. Trout fishing on the Guadalupe should be good well into the spring this year. Bass fishing is usually slow this time of year but we have still been having some luck on the warmer days. Good flows on the San Marcos and Llano Rivers should give us some great bass fishing once things warm up a bit. The Colorado River has been high all winter, but with dropping lake levels the flows should return to normal in the coming weeks. Most of the largest Guadalupe and Largemouth bass are caught during the late winter and early spring on the Colorado River. Higher winter flows on our local rivers mean good runs of white bass in the late winter and early spring. The Llano, Pedernales, San Gabriel, and the upper Colorado should all be good this year. White bass runs on the lower Colorado have been getting more consistent as well. Early December Fishing... So many options! 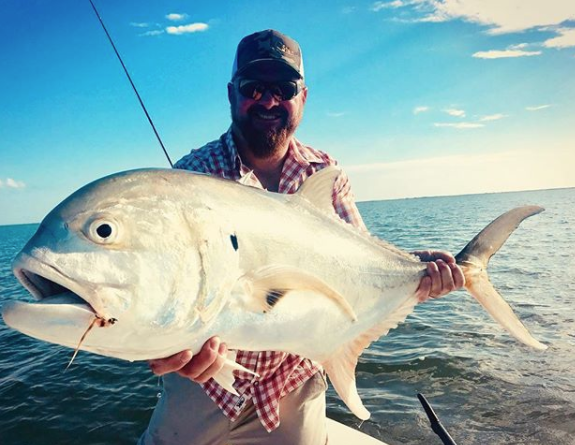 Like we have been saying the last few fishing reports, here in Texas we are really lucky to have several fishing options in the Fall, and that holds true into the coming Winter months as well. 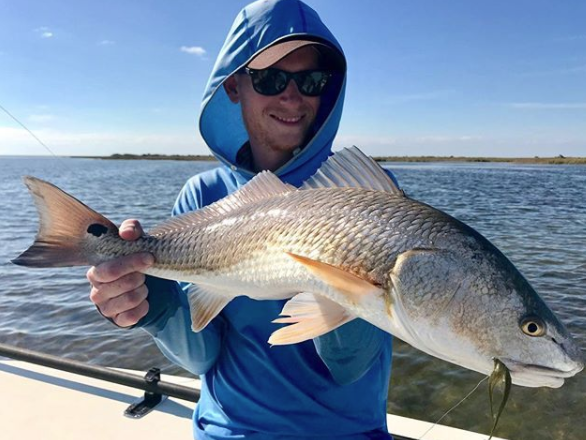 Depending on the weather you can choose between trout fishing or bass, and redfish anytime. 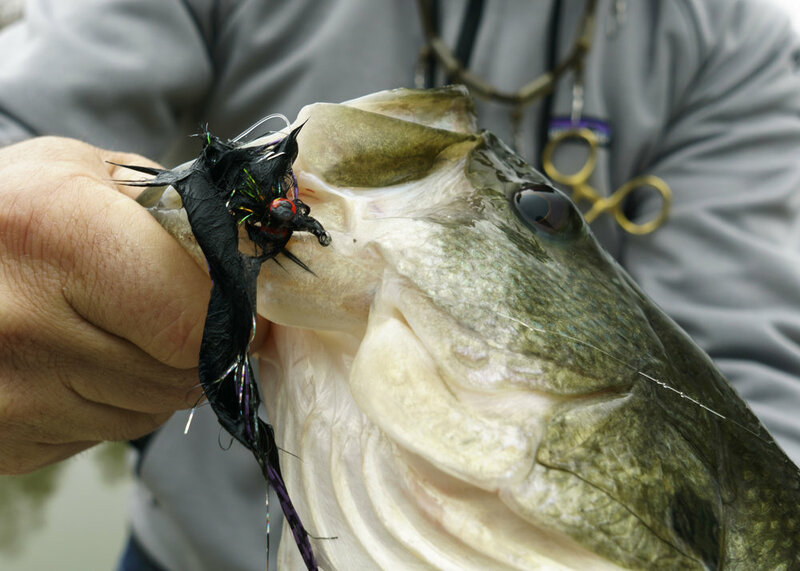 However, with the temperatures switching back and forth the way they have been, it's important to be aware of how those changes affect the bite. Understanding how the fish may react to various changes in their environment will help you decide which fish to target based on conditions and how to adjust your technique to improve your chances of getting the bite you are looking for! For most of us over here at All Water Guides, this is hands-down our favorite time of year to target big bass. The bass are getting ready for the winter and all sizes are feeding like crazy right now! The varying temperatures lets us fish all types of flies, from poppers and minnows to deep sinking crawfish. If it has been a little chilly over night bass may be holding in deeper holes away from the bank and will eat if the presentation is right. As it warms up the during the day they will probably move toward the banks to warm up and feed on bait fish more aggressively. Several warm days in a row can even lead to some fast action with poppers. Late Fall is setting in with a cold front that is about to hit us the first of this week. Some of us guides will probably pull out the sinking line with a small crawfish early in the day and work it slow, then switch to a floating line with a bigger crawfish when it warms up a bit and give it a bit more action. If you go out with one of our guides these are some of the techniques they will use to put you on the fish. 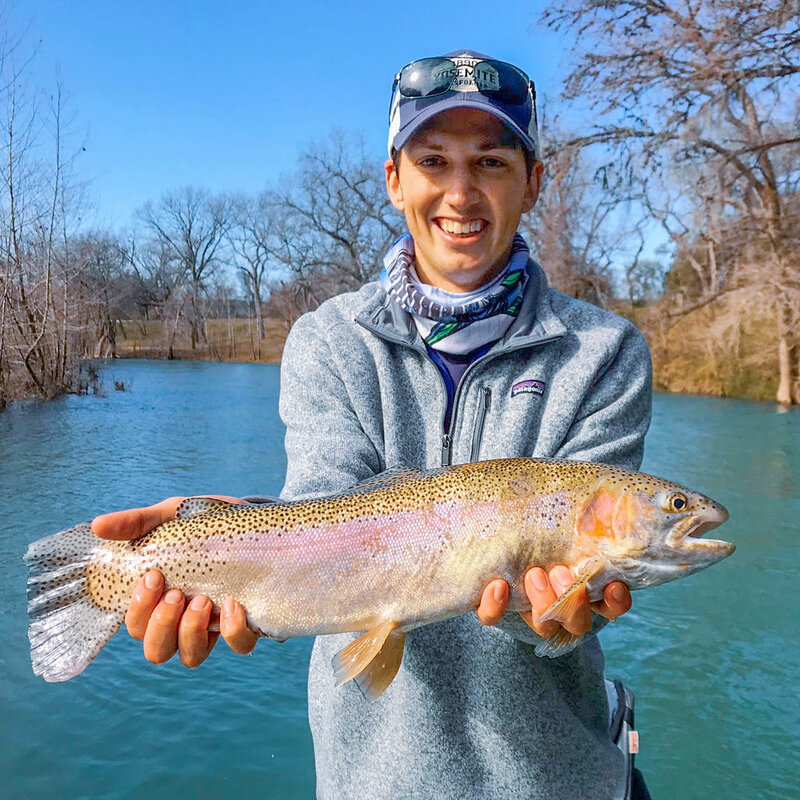 Many anglers start thinking about trout this time of year, and the Guadalupe River is the number one destination for Texas trout fishing. Freshly stocked trout can be caught on a variety of attractor patterns. Stripping streamers or floating a nymph below a strike indicator are a couple of preferred methods. The Guadalupe is low and extremely clear right now so the trout spook easily and will become extremely selective as the season progresses. But, trout are being stocked weekly and overall catch rates are expected to increase as the numbers of fish in the water goes up. Light leaders and small flies will be necessary to trick the trout as they become more wary due to increased fishing pressure. As always our guides are on the water daily to stay on top of what is working to put fish in the net. And don't forget about the redfish! 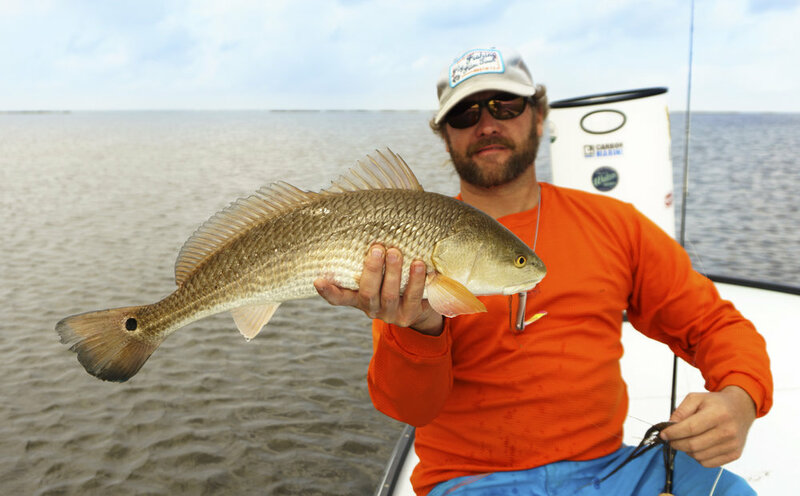 Captains Alvin Dedeaux and JT Van Zandt are the go-to guides for site casting for redfish on the Texas coast. The fishing is so hot right now that there is not much to say except you gotta try it to believe it! Changing Seasons, Changing Fishing Opportunities. The big cool down in our weather this week reminds us that things are changing for our local fisheries... and changing fast! That means it's time to break out the sinking lines and weighted flies for bass fishing. Our favorite bass flies this time of year are weighted crawfish and leech patterns. And, fishing slow and deep will produce the most strikes. Some of our biggest bass are caught between now and the spring spawn! Also, timing your fishing trip can be important this time of year since bass tend to be most active right before a cold front or after several warm days. So keep your eye on the weather report before you head out! And last, but definitely not least, late fall in Texas signals the beginning of the highly anticipated trout season. The Texas Parks and Wildlife will begin stocking our local trout stream, the Guadalupe River, starting in December. You can find the stocking schedule here. Scroll down to the Canyon Tailrace to see the schedule for the Guadalupe River. The more effective methods to catch trout on the Guadalupe tends to be nymphing or stripping streamers. Stay tuned to this page for more info on specific patterns as the season gets going. Prime time on the Guadalupe runs mid-December through March, so make sure you set the hook on a guided trip with AWG's this year before our short trout season gets away from you! So... time to dust off those waders and the puffy jackets and get out on the water! January in Texas is not like most places. One day can be in the 30s and the next day can be in the 80s. The good thing for us fishermen is that we have good fishing opportunities no matter what the weather does. 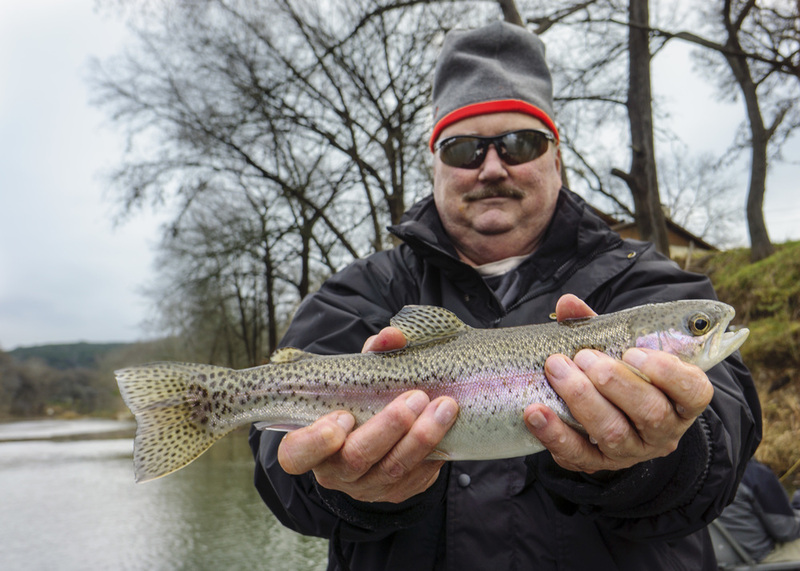 Trout are stocked on the Guadalupe River through January and February. With the current good flows the trout season should continue well into March. 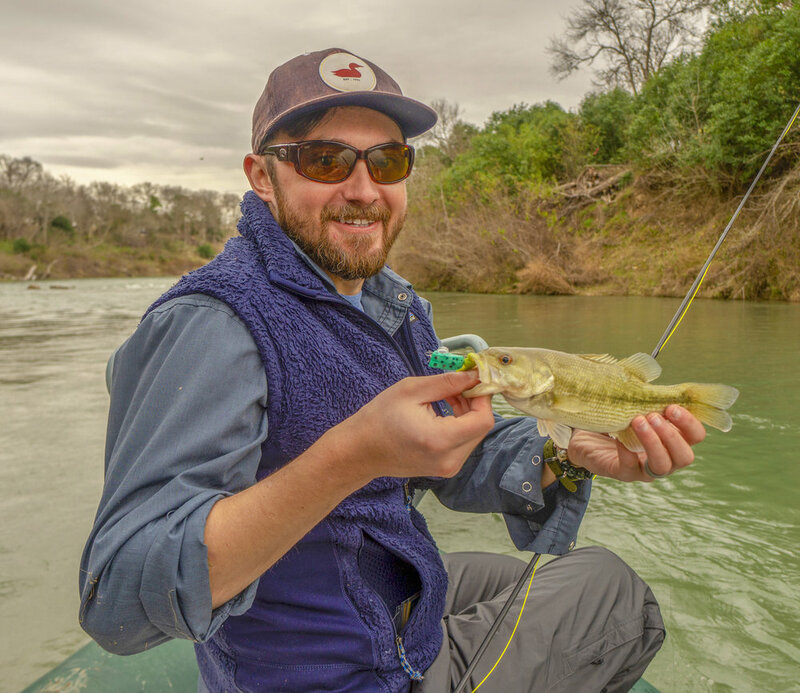 Cold and cloudy or rainy days also offer a chance at some of the Guadalupe River Striped Bass. The current state fly rod record Striped Bass was caught in the Guadalupe River by John Erskine one of our guides. Winter and early spring are one of the best times to catch some large bass on the Colorado River. Both largemouth and Guadalupe bass will be putting on weight in anticipation of the spawn. The current world record Guadalupe bass was caught on the fly in February of 2014 in the Colorado River. Largemouth bass over 5 pounds are a real possibility this time of year as well. Fall has finally arrived in Central Texas. With the cooler weather come some of the best fishing of the year. Due to a very rainy year, most of our rivers are in better shape than they have been in along time. 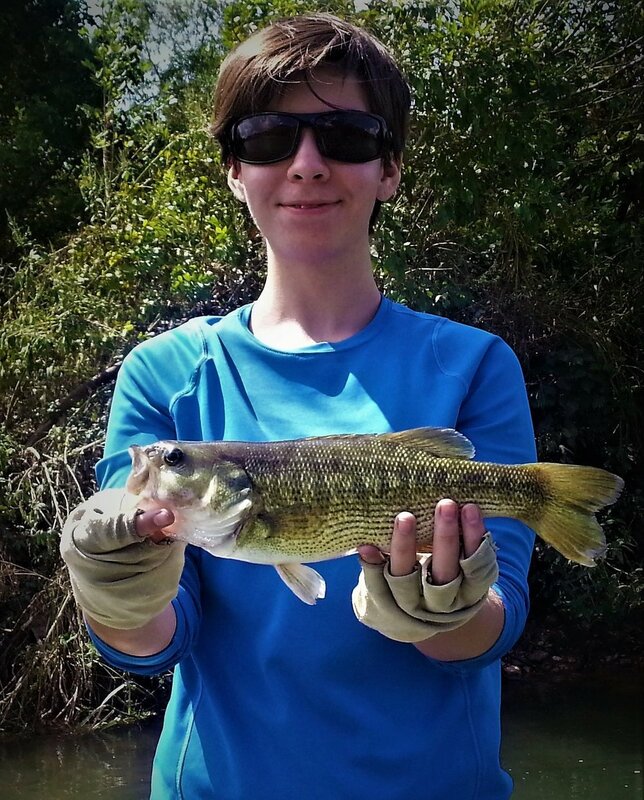 Bass fishing has slowed down on most our local streams. The Colorado River is the exception. We are still picking up some nice bass by fishing deep and slow. The Colorado River fishes well all winter, the key is to fish during a warm period. Two or three warm days in a row is all it takes to get the bass in a feeding mood. The numbers of fish caught this time of year will not be as great as the warmer months, but the chance of catching some really large fish is better during this time of year. 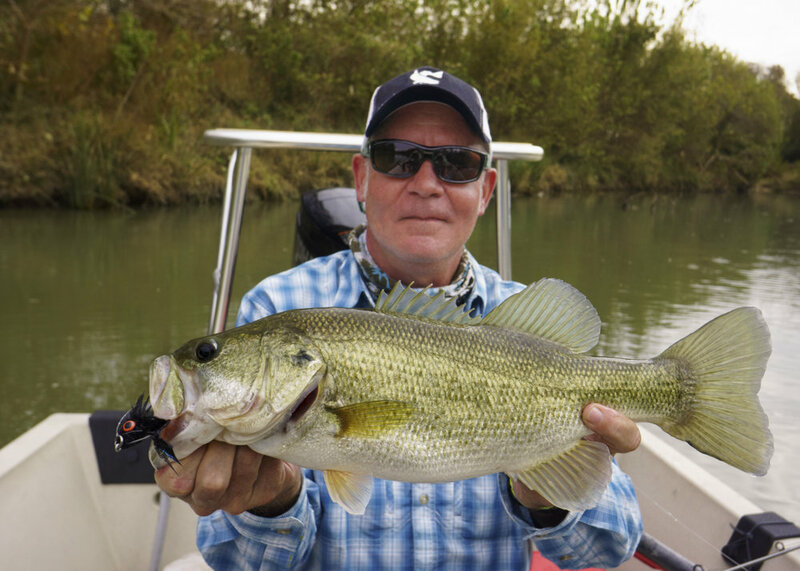 The current state record Guadalupe Bass was caught in February of 2014 by one of our clients. 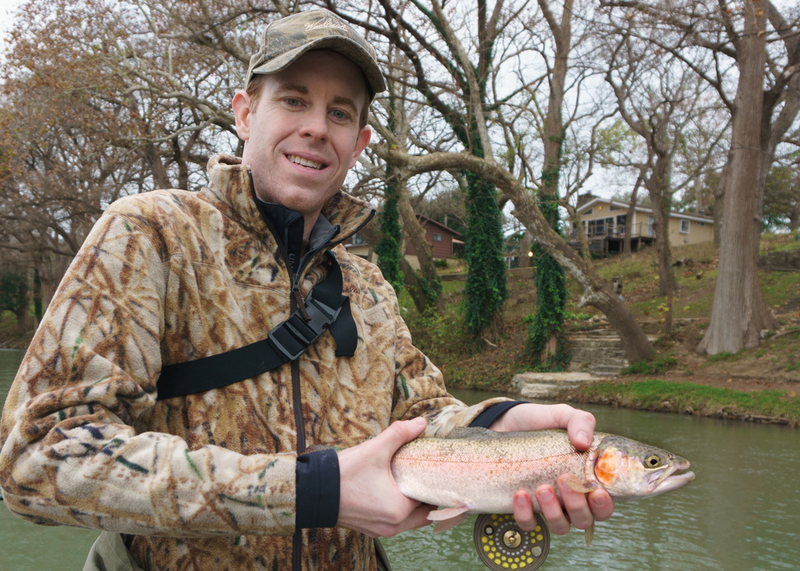 Trout fishing in the Guadalupe River is best from now through March. Unlike the bass on the Colorado, the trout fishing can be good even on the coldest days. Texas Parks and Wildlife and Guadalupe River Trout Unlimited will be stocking the river through February. Cold water flowing from the bottom of Canyon Lake dam creates the southernmost trout fishery in the United States. 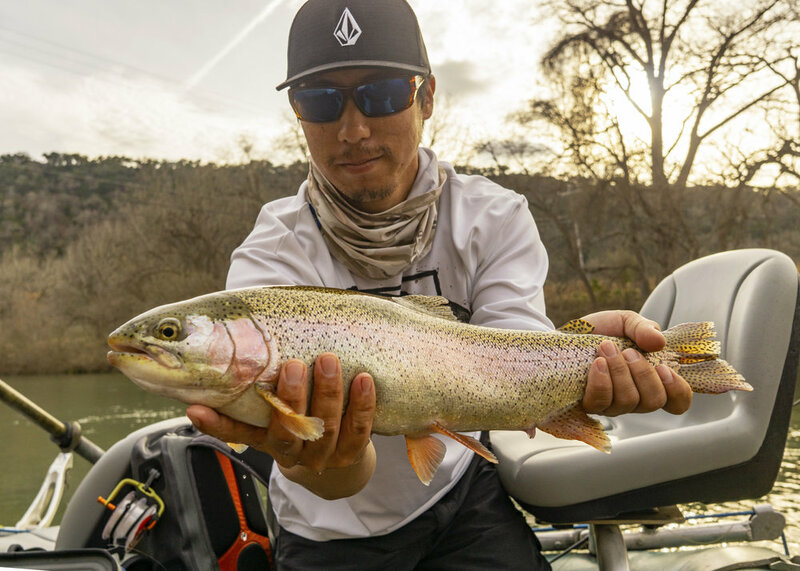 Like most other tailwater fisheries, strike indicator nymphing is the most productive way to fish the Guadalupe River. Most of the fish in the Guadalupe will be between 12 to 14 inch range. Fish over 20 inches and larger are caught every year. Bundle up and get out on the water! 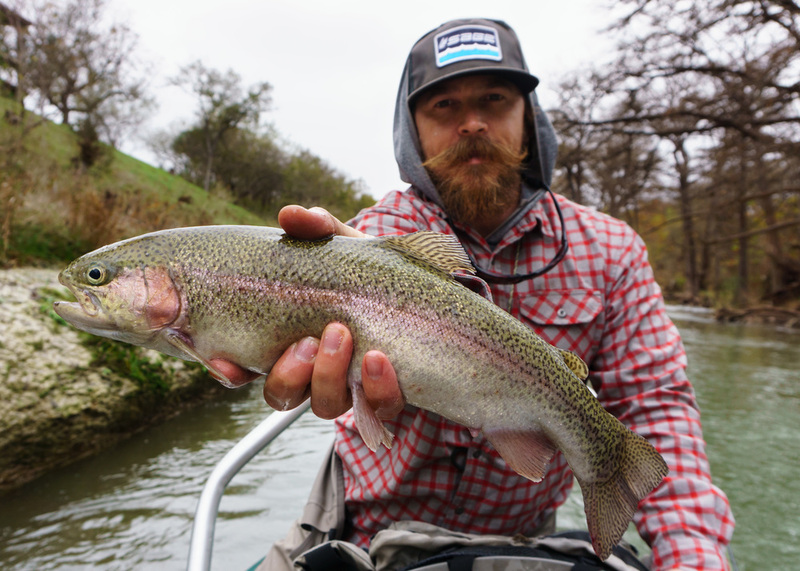 December means the beginning of trout season and midway through the month the Guadalupe River is starting to deliver. The El Niño weather pattern has meant ample rainfall this past summer and fall — in addition to the floods of late October — have given us higher than normal flows (500+ cfs) than we have experienced in recent seasons. This is a good thing! These high flows will also benefit the aquatic insects that sustain our trout, which in turn will help our trout survive the summer. The last several seasons were plagued by extremely low flows (50cfs t0 150cfs), which was hard on the fish and the anglers—not to mention guides who ended up dragging their rafts for long stretches of the river. We have been guiding the Guadalupe for close to two-decades and can remember flows averaging between 300 and 900cfs in the 1990’s and up until 2007. With the higher flows has come off-colored water, which continues to improve every day. The river’s water temps are in the low to mid-60s allowing our trout to acclimate to the river. The TDPW and GRTU completed multiple stocking so there are plenty of fish in the river for fly anglers. Every trip out we are hooking and netting more and more trout per trip. 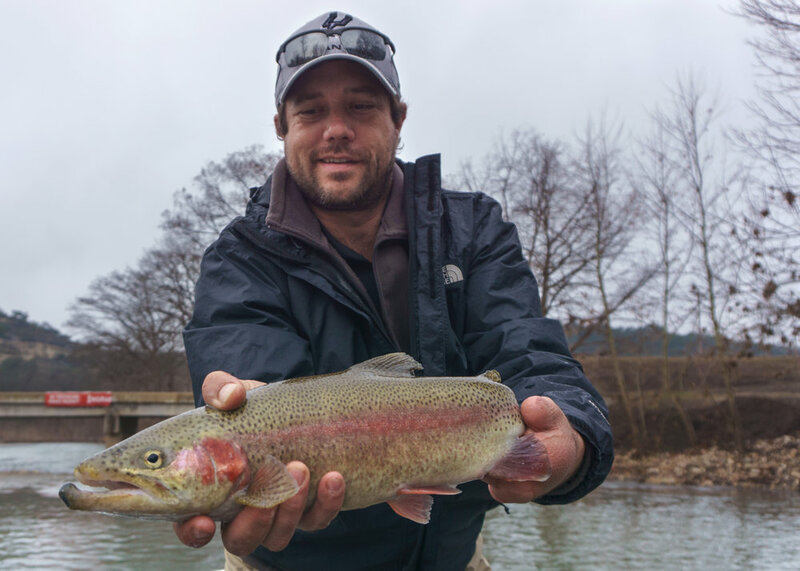 Clearing water and more stockings by TDPW and GRTU in January will only improve the trout fishing. We still have a few opening in January and February so don’t miss out on what is shaping up to be one of the best seasons in a long time. What’s been working is mostly large attractor patterns like worms, eggs, and rubber-legged nymphs. That’s not to say that we aren’t getting bit on imitations of natural, like Trico emergers, PMD emergers, RS2’s and BWO nymphs in size 18-20. Darker patterns with flash and beads seem to help as well. As important as fly selection is, getting your rig set up correctly — long leaders with plenty of split-shot — is super critical. Additionally, we prefer larger Thinga-ma-bobbers to float heavier rigs and 3X and 4X leaders—higher flows and off-color negates “leader” or “indicator” shyness. Multiple drag-free drifts in the same area is the best way to target the trout. Most of our hooked fish come from the tenth or twentieth drift in the same area—be patient and methodical! A note of caution: During the last two weeks our guides have watched more than our share of waders and kayak fishermen having mishaps due to the high flows. 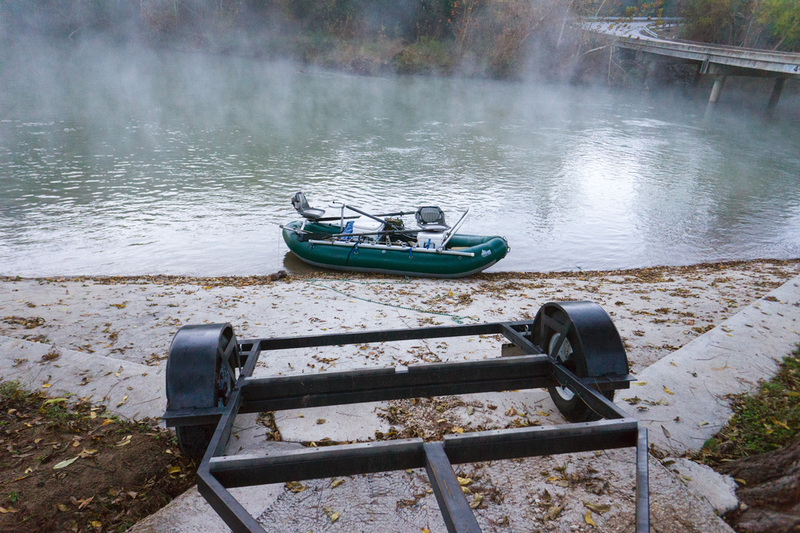 The Guadalupe River at 400cfs and above is no joke — it is difficult and hazardous to wade. Many of the GRTU lease areas are wader friendly below 400cfs, but for now please use great care and commonsense. As for kayak fishermen, please wear your PFD at ALL times. We have watched kayaks flip while attempting to navigate the Weir below fourth-crossing, Ponderosa rapids and the Devil’s Playground. Our guides are experienced in white water rowing and respect the power of the Guadalupe insuring safe trips for our clients even in high water flows. So when choosing a guide service, remember, to select a guide who has decades of experience of rowing and catching trout in fast water — choose All Water Guides! There is no doubt what winter has come to Central Texas. When the mercury drops and the wind blows us fishermen are in serious danger from a case of cabin fever. Fortunately for us we have a some great options this time of year to get out and catch a few fish. The Guadalupe river is the first spot that comes to mind this time of year. 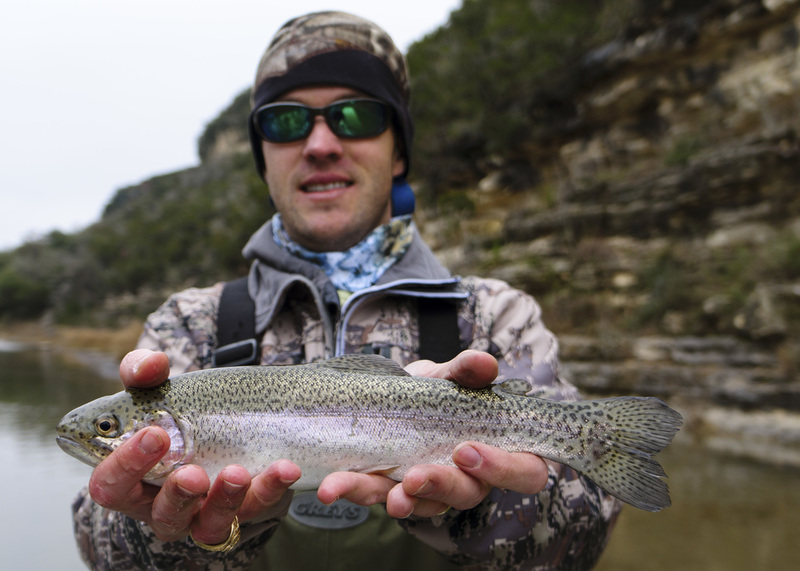 The Guadalupe River below Canyon Lake is stocked with Rainbow Trout every winter. Texas Parks and Wildlife and Guadalupe River Trout Unlimited both stock the river from November through February. Most of the fish stocked by TPWD will be in the 8" to 12" range. GRTU stocks larger fish, sometimes up to 20" and larger. 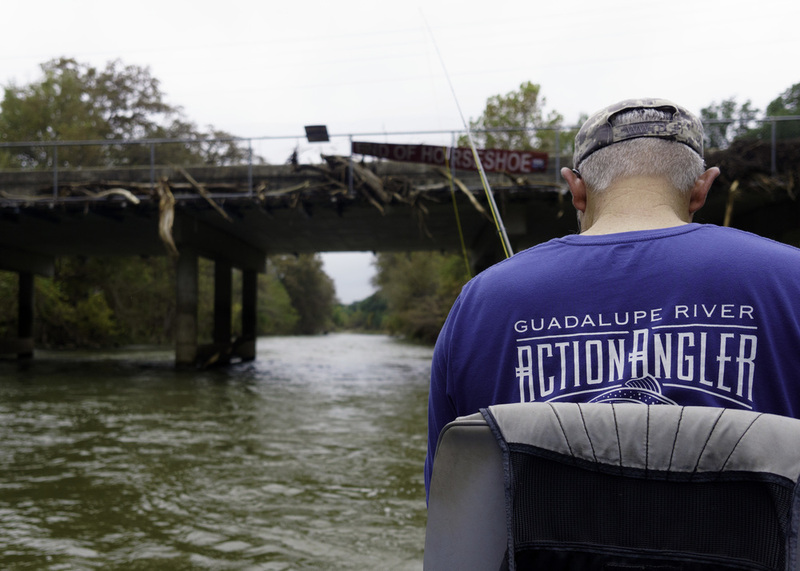 The banks of the Guadalupe River are mostly, but there are quite a few access points for wading anglers or those wanting to launch a boat. Rio Guadalupe Resort, Lazy L & L Campground and The Action Angler are a few of my favorites. The nice thing about the Guadalupe this time of year is that no matter how cold and wet it gets you can still fish. The trout are usually more active when the weather is bad and the fishing pressure will be a lot less. Check out some recent photos below. If you are looking for some solitude, the Colorado River is the place to be. Bass fishing on the Colorado River is a year round proposition. After a few warm mid winter days the bass will be on the move and feeding. The nice thing about winter fishing on the Colorado is the chance to catch some really big fish. The new world record Guadalupe Bass was caught in the Colorado River in February of 2014. 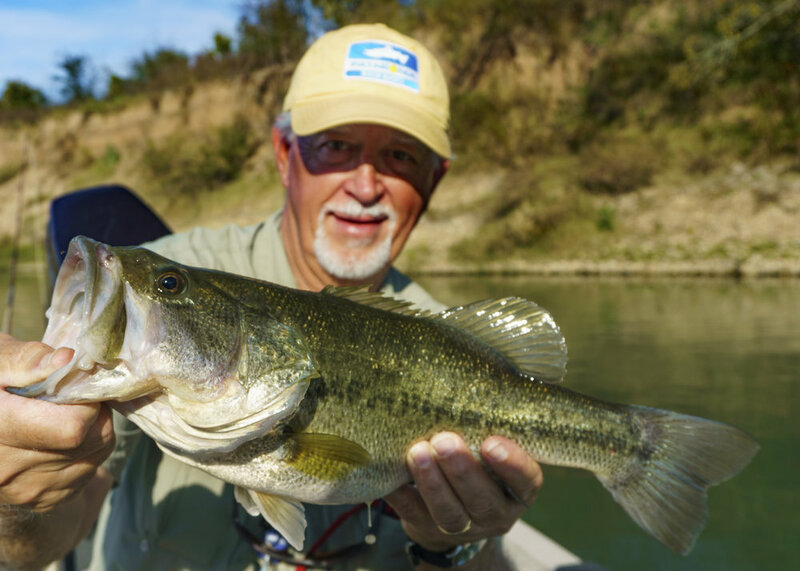 Several Guadalupe Bass over 3 pounds have been caught so far this winter. We have caught some really nice large mouth bass as well. The trick is keeping an eye on the weather. Fishing will be best after several days in the 60s. Fishing will be slowest right after a cold front moves through the area. While there are miles and miles of great water on the Colorado River, access is limited for paddle craft and wading anglers. The easiest place to access the Colorado River is at Little Webberville Park. Cooks Canoes rents canoes and runs a shuttle service. Some recent Colorado River photos below. Of course we are doing full day and half day trips all winter on both the Guadalupe and the Colorado. Drop us a line if you have any questions or if you want to book a guided trip. Today we did a 4 boat trip on the Guadalupe River with the guys from MGC Contractors. It was cold and cloudy for most of the day, but the fishing was good so we didn't really notice. Most of the guys had never fished the Guadalupe before but everyone did a great job on the water. We caught quite a few nice rainbow trout up to 17 inches. The most productive patterns were San Juan Worms and various attractor nymphs.